Loaded with tens of tons, clew rings that melt under stress, mainsail battens as long as a Maxi yacht mast... these are just some of the elements a superyacht sailmaker works with everyday. While we try to wheedle out the secrets of this profession, we discover, surprisingly, that the traditional sailcloth still has much to say. This article is the first of a series of detailed discussions on superyacht sails that will continue in the next Nautica Superyacht issues. Machine custom-built to Doyle Italia design for one of Doyle's sail-lofts. 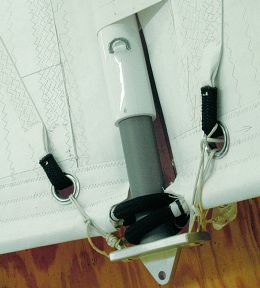 The modified arm permits insertion of the rolled sail of a Perini. Until recently a 20 m. (65ft 6 in) racing boat was so long that it was classified as Maxi yacht. 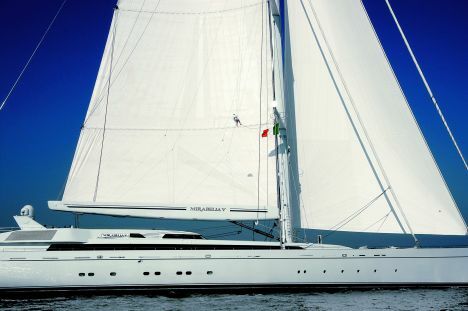 Then the superyacht category was minted, yet the name seemed inadequate for sailing yachts so the term megasailer was coined and is now frequently used. Today, any vessel measuring less than 30 meters in length is "small" if seen from the deck of the Mirabella V - 75 m. (246 ft) long hull and 87 m. (285 ft 5 in) high stay. Shall we distinguish a racing maxi yacht from a superyacht and a megasailer? The differences are important and are dictated by the size and therefore by the adopted technical solutions, rather than by their application. Even though most superyachts are cruising vessels, still captains and owners might be very demanding as regards performance. Besides, races especially organized for this type of yachts are more and more frequent in the US, New Zealand, Australia, the Caribbean and even in the Mediterranean. It is difficult to understand the dimensions of the products designed and realized by a sailmaker for this type of clients. The concept of small sail loft is no more suitable. Only groups that operate on an international level, with pools of technicians coming from the best local realities, are able to handle projects of this type contributing in the making of sails in sail lofts all over the world. Production concentrated on a single unit would create production highs hardly endurable. First of all, an analysis of the load map is made to evaluate the amount and the direction of loads and to determine the type and thickness of sailcloth to be used, the size of the accessories, etc. But a fundamental difference distinguishes sail design for a superyacht: the handling difficulty caused by the exponential growth of the loads at stake. This means that the sailmaker cannot simply design the sail but he also should try to prevent any possible consequences due to anomalies or slip-ups. A small maneuvering error, such as an inappropriately tensioned halyard, generates a peak load on the luff slides of a few tons and inevitably damages the sail. Inconveniences of this type may prevent the boat from sailing for at least ten days - if the problem is rapidly solved - or even twenty or thirty days. If it were possible to work wonders four persons would take approximately 8 hours to remove the staysail of a Perini yacht, for example, whose sail may weigh 500 kilograms - the sail of Mirabella V weighs a little less than 2000 kilos! Another day's work should be added for the crane to remove the sail from the boat and load it on a truck, add an extra day for depositing it in the sail loft. Then calculate the time needed for fixing it plus the time to take it back on board, following the same procedure backwards. This, maybe better than anything else, gives the idea of what we are talking about. We start our journey in the world of supersails by visiting Francesco Valenza, one of the four Doyle specialists in charge of superyacht management and that manufactured the set of sails of Mirabella V and Maltese Falcon. 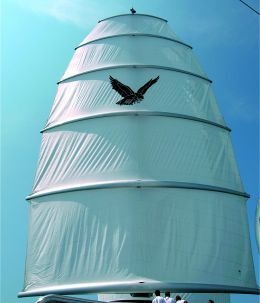 "Let's start from the fact that it is very difficult to handle sails of this type. What on a normal yacht is part of the game and doesn't have any consequence, on boats of this size is simply unbearable", he explains. "Consider, for example, the Mirabella V mainsail batten. This carbon fiber pole is 25 meters long, just as long as a Maxi yacht mast. If it shakes inside the sail, or if it hits the tip of the batten pocket, it produces terrific loads that no material can sustain. Or, just think of the load on the jib clew, something like 37,000 kilos!" On these boats, sheets have to be water cooled when they are hauled on winches otherwise they melt. Which material should be used? How should they be assembled? Which technical solutions should be adopted? The variables on superyachts are such that materials the characteristics of which are not durable are generally avoided. In order to obtain the right compromise between high performance, abrasion resistance and durability, weaving technology might be reinterpreted. "On Mirabella V, for example, we used Vectran yarns in a patented bi-axial combination", explains Valenza. Removing the thin film at the basis of laminates considerably increased bending and folding resistance. Reinforcements in the areas of greater stress, such as clew, tack and head or reef pendants on sails of this size, cannot be made in a traditional way, that is, by simply overlapping cloth layers or panels. In this case, layers of Kevlar would be 4-5 centimeters thick, making it be impossible to sew them together. For the clew, Doyle sailmakers use Spectra rope - instead of the traditional stainless steel grommet - with a diameter of up to 36 mm (1 in. 7/16 ). First the sheath is removed, then it is folded in two, after that the U- shaped rope is applied to the sail so that it sticks out of the cloth for the sheet to be attached to it. Strands of the two ends are unlaced, opened up in a radial pattern, extended and oriented toward the center of the sail, lastly they are sown on both sides. In this way the load is not concentrated on the spectra rope or in the area surrounding the clew but it is distributed on an arc of circumference having a ray of a few meters. 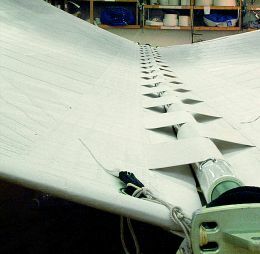 The same procedure is used for the head, the connecting points of batten pockets to battcars and the reef cringles. To prevent the spectra loops from melting they are covered with spectra sheathing which works as an anode, to be replaced when worn. For the Mirabella V mainsail - 75 m (246 ft) high luff, 25 m (82 ft) long foot - an innovative solution was found: it was divided into seven parts. Instead of inserting the batten in the mainsail we thought of doing the opposite so we inserted the sailcloth in the batten, as if the batten were a second boom. 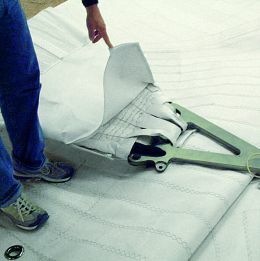 The top and bottom of each sail panel is entered in a batten and strain and compression are adjusted with an outhaul. In case of damage or maintenance, each sail bag weighs less than 350 kilos. Doyle created these special battens in collaboration with Van Dusen Racing Boats, Division of Composite Engineering of Massachussetts. Once the solution was found, research was conducted to understand how to make use of its characteristics. So, for example, the lower battens are all in carbon fiber, while the upper ones are made of carbon- reinforced triaxial glass the bending angle of which is three times bigger. Shock absorbers - a sort of motorcycle fork - were used to solve the problem of the enormous peak load on the slides. Initially, we used a spring, then hydraulic pistons. The system has been tested on a 12-meter boat for a long time to record and assess the amount of pressure at stake. Then, we carried out test on a full-scale. 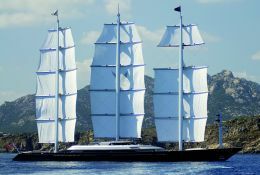 The idea of somehow subdividing the sail, successfully experimented on Mirabella V, finds a radical solution in the "bizarre" rig of Maltese Falcon, with a sail plan divided into small lengths - where small means a surface of 300 sq meters (3,226 sq ft). Everything originates from the need of having a performing and easy to handle boat with lower risks. When looking at the Maltese Falcon under sail, one remains open- mouthed at seeing that the main masthead bends up to 3 meters to leeward. But after all, this is the technology of a large crane: its bottom fixed, it may rotate and function with a projecting part. The loads and dimensions posed the real problem. Think of the 170 centimeters ( 5 ft 7 in) of diameter of the mainmast. From a practical point of view, the Dyna Rig - this is how a pivoting mast without shrouds is called - has enormous advantages: there are no blocks, no sheets, no running backstays, etc. This is important for the safety of guests and crew, and it also greatly simplifies sail handling for the captain, of course, not for the sailmaker. "For us, this was a completely new way of thinking, designing, testing and handling a sail" points out Valenza. Initially, we realized a scale model, then one in full-scale of just the two lower sails - as of now, this model is stationed in the Perini yard in Turkey. We had to solve several problems. First, should the sailcloth be rolled around masts or yards? After opting for the first solution, we had to choose the type of slot, dimension the slides, find out how the airfoil (section) would be adjusted, solve how to tension the foot, etc. 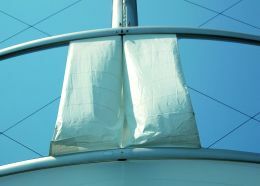 Each square sail is a single piece of cloth with a tape at its center connected to the roller furler fitted inside the mast which, when operated, pinches the sail with the tape and drags it inside the mast. Each piece of fabric is entered in the upper and lower yard, with evident chafing problems. An extremely delicate part of the job was making the sailcloth enter and leave the yards smoothly. Maltese Falcon Owner is a sailing enthusiast who loves to take advantage of his extraordinary vessel. This means something like 3000 sail unfurlings and furlings per year therefore it is fundamentally important that the materials resist not only to abrasion but also to curvature. Surprising, as it may seem, the first set was in Dacron and with horizontal panels. "It's true that it does not hold its shape particularly well under load," Valenza confesses, "but this allowed us to carry out all necessary tests without having to replace a set after the other". When Dacron first appeared on the market, it was a real revolutionary sailcloth for the sailing world, with fibers appearing as a set of small twisted yarns, more compact and more resistant than natural fibers. Since then, Dacron was heat treated to reduce and tighten the yarns or chemical dipped to increase its resistance to bias stretching. 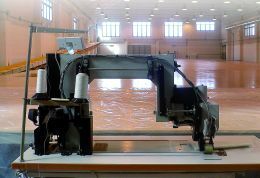 With warp- oriented fabrics, radial cut was introduced. Normally, the fill is thicker than the warp, but in this case the yarns have equal strength in both warp and fill - the weave is balanced. Finally, there is the so-called yarn-tempered sailcloth, a more delicate fabric and very similar to a laminate, which is dipped in a resin so that its modulus becomes more compact. Apparently, even though many persons consider this material obsolete, it has still much to say.